A man with a gun walked into the 7-Eleven on Leary Way and 47th St. on Saturday night, sparking a strange standoff that shut down traffic in the area. It began just before 11 p.m., and customers and employees were able to escape. A SWAT team and negotiator were called, and they watched as the gunman danced around the store, cleaning and exercising. Finally, at 1:40 a.m., the man put on his jacket and exited the store with his arms in the air. MyBallard.com has more coverage and photos from the scene. The wall is located on the north side of the underpass at N. 46th St. and Aurora Ave N. The space is described as “a long wall divided in to 3 sections that taper on both east and west ends– mural design also to include 9 columns that stand in front of the mural wall”. West section: approx.1000 sq. ft.
Middle section: approx.1300 sq. ft.
East section: approx.1200 sq. ft.
9 columns: approx. 100 sq. ft. ea. Once a design is selected, Urban Artworks will serve as project manager and do the actual painting of the mural. At this time, the 46th Street Mural Project is only looking for an artist to design the wall. Professional artists with previous experience creating outdoor murals are preferable, but all may apply. Artist will be required to be present at the community meeting (early in the process) and dedication (at the completion of the mural) unless distance is prohibitive. If this occurs, an alternative plan will be discussed with the 46th Street Mural Project Steering Committee. The artist must be available for consultation pertaining to the execution of their design throughout the process. More information and specifics about the selection process can be found on the group’s Facebook page. Artist applications are due by February 19. Anyone interested in applying should submit work samples, resume and references to 46thstmural@gmail.com. The project is slated to begin in May. A male pedestrian attempting to cross Aurora Ave N near NE 45th St last night was hit by a vehicle heading south on Aurora. According to the SPD Blotter, the man was crossing west on Aurora when he was hit by a Chevrolet Blazer shortly after 8 p.m. Fremont Universe reader Jakey wrote in the forum that he witnessed medics performing CPR on the man in the road before he was taken to the hospital. The man was transported to Harborview Medical Center where he died from his injuries. Southbound lanes of Aurora were closed as officers investigated the scene. The driver of the Blazer showed no signs of impairment and was interviewed and released. Traffic Collision detectives will continue the investigation. A new all-organic center for childcare and early learning recently opened in Fremont, and it’s believed to be the first facility of its kind in the state. Our Beginning (123 NW 36th St) opened its doors on January 4 and its aim is to be green and organic with everything – from the paint that went on the walls to the food that goes into the kids’ bellies. The daycare focuses on children 6 weeks to 5 years old and follows the Reggio Emilia approach to development and education. Curriculum is based on the needs of the children enrolled there. The daycare is open Monday through Friday from 7 a.m. to 6 p.m. A full-time chef prepares and provides a fresh, organic breakfast, lunch and snack every day. To find out more about enrollment procedures, click here. A benefit concert at High Dive (513 N. 36th St) this weekend is raising money to aid Haitian relief efforts. 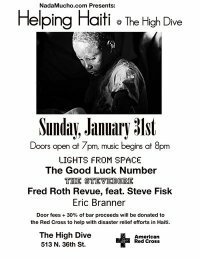 Helping Haiti @ The High Dive features performances from local bands Lights from Space, The Good Luck Number, The Stevedore, Fred Roth Revue featuring Steve Fisk, and Eric Branner. There’s a $7 suggested donation at the door. 100% of the door fees and 30% of bar sales will go to the American Red Cross. Doors open at 7 p.m. Music begins at 8 p.m.
Mondays, 4 p.m. to 7:30 p.m.
Thursdays, 10 a.m. to 3:30 p.m.
Mondays, 1 p.m. to 5 p.m. The state house vote was nearly-unanimous yesterday to ban the chemical, moving the bill on to the State Senate. “I’m proud we united 95 to 1 to protect babies and young children from BPA-laced food containers,” said Dickerson (D-Seattle). “The strong support for this bill reflects the overwhelming evidence that kids need to be protected against this very toxic substance.” Representative Bruce Chandler (R-Granger) was the lone nay in the House. Two representatives were excused from the vote. After the first reading in the State Senate today, the bill has been referred to Health & Long-Term Care. If this bill passes, Washington state will be the third state to ban BPA, following Minnesota and Connecticut. Seattle Parks and Recreation will begin removing invasive plants along a section of the Burke Gilman Trail on Monday, February 1. The plants being removed are in an area between Meridian Ave N and Latona Ave NE on the north end of Lake Union. The removal is part of the Cheshiahud Lake Union Loop plan that was completed in 2009 (see map on the right or click here for a larger view). The 6-mile loop aims to improve access to Lake Union, as well as better connect adjacent neighborhoods, downtown, University of Washington and the Burke Gilman Trail. Although the trail may narrow in places where plants are being removed, the trail will stay open while work is being done. To view the loop’s Master Plan, click here (.pdf). You might remember that back in October a production crew from the Travel Channel spent a day shooting a segment at Paseo’s Fremont restaurant (4225 Fremont Ave N). At the time, the producer told us it was for an upcoming series that was supposed to air around Thanksgiving. I kept checking in to try and pin down an air date but the schedule appeared to have been postponed. At last I’ve discovered the show has launched. The 5-part weekly series is called “101 Tastiest Places to Chowdown”. Paseo will be featured in tonight’s episode counting down numbers 40-21. The show airs at 10 p.m. on the Travel Channel (Channel 36 on Comcast) but will re-air many times after that. You can also catch up on numbers 101-41 in reruns beginning at 7 p.m. Unfortunately, if the show makes your mouth water for a Carribean sandwich, you’ll have to wait another week to get one. Both Paseo locations in Fremont and Ballard are still closed for vacation. For more than a week we’ve been hearing of all the different ways local businesses are supporting relief efforts in Haiti. Homegrown Sustainable Sandwich Shop (3416 Fremont Ave N) is another one doing what they can to raise money. 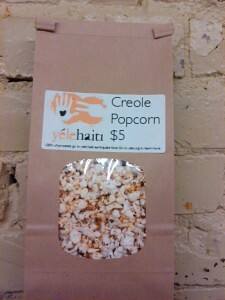 Chef Rob Milliron has created a homemade organic Creole popcorn that they’re selling for five bucks a bag. A first batch quickly sold out so he’s whipping up another round that will be ready for sale today. This time 100% of sales from the popcorn will go to the American Red Cross (last time proceeds went to the Yéle Haiti Earthquake Fund – it’s their way of “spreading the love”). The Creole seasoning on the popcorn includes ingredients such as chili powder, cayenne, garlic powder, oregano and sweet basil. Chef Rob describes the flavor as “spicy and smoky, but also sweet”. Grab a bag while you can!